My Time At Portia is not a game about horses. To be perfectly honest, it doesn’t have particularly beautiful or well-animated horses, they occasionally glitch around a little and there’s not even really all that much to do with them. Despite all this, Portia still manages to be among the better choices for “a good horse game”, simply because there are horses in it and it is very much a good game, which is not a label I’ve felt comfortable with putting on any horse game since that one time in 2003, and even that one might not hold up if I played it today. My Time At Portia was kickstarted in fall 2017 by 3708 backers including myself, and developed by Chinese indie game studio Pathea, previously known for their (not particularly well received) debut title Planet Explorers. Team 17 joined the project as its publisher during the crowdfunding campaign. My Time at Portia is a life sim and crafting RPG in the vein of games like Stardew Valley, Slime Rancher or the Harvest Moon series. 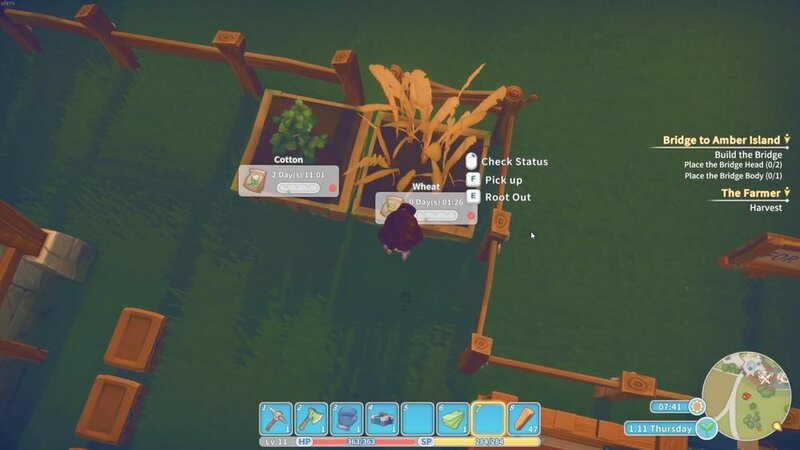 While farming crops and raising animals are among your options, your primary business is a workshop where you construct all sorts of machines and gadgets out of materials that you’ve gathered, mined and looted in and around the town of Portia. While you’re waiting for your furnaces to smelt your ore into bars and for your cutters to spit out hardwood planks for your next piece of furniture, you explore Portia’s surroundings, fight, loot or mine yourself through a few procedurally generated ruins, or make the Portia villagers like you by talking to them, giving them gifts and even going on dates with them. As with many games in this genre, there is a calendar with seasonal events and special occasions, which offer a variety of minigames, challenges and rewards. Taking care of your furnaces and other crafting processes is a big part of the game. Many of the quests are about crafting, repairing and exploring. Portia’s residents give you quests and hints about where to find more quests, they offer commissions for machines, trinkets and furniture that you can then assemble in your workshop in order to earn some cash. Many quests involve building and crafting, but the mission log also introduces you to farming and fishing, encourages you to explore and discover. Sometimes a quest makes a new area available to you after you’ve helped craft the necessary bridge parts or transport systems, which in turn provides money for the workshop. At the time of writing, I’ve spent about 45 hours with the game, which barely concludes the first year of my time at Portia. Small things are crafted at a worktable, bigger constructs are put together on your assembly platform following the instructions in your handbook. Chatting with NPCs is good for receiving tips or missions and for improving your relationships with the townsfolk. If you get into Portia with the express desire to buy and ride horses, prepare to be patient. Building a stable costs a sum of money that will take beginners a while to save up for and a bunch of building materials that you won’t find just outside your workshop in the first few in-game days. I built my own stable in early Summer in my first year of playing, which amounted to something around 20 hours of playtime. Once your Stable stands and you’ve completed a specific quest with Portia’s farmer, you can rent a horse for a few days or buy your own for another 10000 or 15000 G. The horses come in only two different colors (bay and grey) and their color is tied to the price and maximum speed, not leaving you a lot of choice in selecting a horse to buy. There are unfortunately not many horses to choose from. You can pet the horse, which is nice. But where Farming Simulator 19 frustrated me to no end before I finally managed to reach the horses, Portia offers plenty to do, and makes your progress feel satisfying, rewarding and simply fun all along the way. If you don’t want to spend your hard-earned Gols on buying a horse, you can also tame one of the colorful llamas that roam the fields around Portia. Build a trap, buy some llama bait (consisting of cumin and lettuce) from the farm store, and you can get a mount much cheaper and faster. The llamas work the same as the horses apart from the fact that there is a taming minigame when you first get one, and that their maxiumum speed is significantly lower. Taming a colorful llama is a cheaper option to acquire a mount. It may be easier to get, but the colorful llama is slower than the horses. Your stable is a small open shelter in which your mounts move around freely. It cannot be upgraded. You can grow food for your animals in your own planter boxes. Unfortunately, what you can do with your horse once you have it is rather limited: your purchased steed stands in your small open stable without any option to remove its saddle. It doesn’t ever wear a bridle or halter. You feed your horses by adding crops to the trough via menu, which you can do for several days in advance. Which crop you feed their horses influences their happiness value. Your horses can be renamed and they have a loyalty stat which you keep up by petting them regularly. They can be “trained” to become faster, jump higher or dash (i.e. gallop) longer, but the training is implemented in a rather minimalistic way: You simply open a menu in your stable and choose which of the horse’s skills should slowly increase in your absence. You can own up to three mounts, and you can not build a second stable. You train your horses via this menu that’s accessible in the stable. Neither horse nor player take falling damage, and the horse cannot be attacked by monsters. The horses’ movement animations are serviceable, but nothing special. The Portia steeds trot per default and can be made to gallop using the shift key, for as long as the stamina meter permits. Walking can be toggled by pressing the X key. This mirrors the walking, jogging and sprinting mechanics for the player on foot. I bought the fastest horse. It’s very fast. In order to pet your horse, you choose “Interact”, but then have to specifically select the “Pet” action from a second menu. This strange and unintuitive UI choice would imply to me that more interactions are planned or will become possible later in the game but I’ve been unable to find any information on this detail. What the Portia mounts excel at is being a quick way to transport you somewhere. The game’s map is sizeable, and the public transport system that the player helps build does not reach every corner. And the horses are fast. Exploring on horseback is made even more practical by the presence of “stay” and “return home” commands for your horse, which give you a bit more flexibility in where to take your horse. Unless commanded otherwise, your loyal steed follows closely behind you once you’ve dismounted anywhere outside. Sending your horse back to its stable and taking the bus home is a neat way to save time. You cannot put your own horses into a pasture. These are the ones living on Portia’s farm. All in all, it’s clear that the horses in Portia were meant to be unobtrusive, practical mounts, rather than companions or challenging projects, which I’m sure many non horse-focused players are glad for. It should surprise none of my readers, that I would have preferred a few more options and mechanics instead, and that I believe it would still have been possible to keep them optional and unobtrusive. Pathea has cited famous Japanese Animation studio Ghibli as an inspiration for their visual direction. The landscapes and environments, the machines and resources all look wonderful, but I am not a fan of the art style used for the characters and animals in Portia. Their faces and proportions of animals don’t work for me at all, bordering on the creepy. A need for stylization is of course understandable in a game of this size and budget, but the exact direction this took is a bit weird in my opinion. Some of the NPCs have their own named horses and can be seen riding them around the town. Come on, that’s a mildly weird cow, right? If there’s anything serious to criticise, it’s that Portia is incredibly ambitious and doesn’t always follow up with the necessary polish. Some features seem a little bit rough around the edges, but I’m still glad they’re there. Upon the game’s full release, the developers announced that although Early Access was over, work on the game would continue. The team responded to a Twitter DM by saying no updates for the horses were currently planned, but my my inquiry on the Steam forums on the subject revealed more players with an interest in more elaborate horse mechanics. My Time at Portia takes place in a rather colorful post-apocalypse and its landscapes are pretty to look at. My Time at Portia is not the horse game we’re all waiting for, but it sure is a nicer way to spend your time waiting for that than any of the actual horse games I’ve played recently. Portia is not and will likely never be a game that you should play solely for its horse riding and horse interactions. Fortunately however, there are plenty of other reasons for me to recommend playing it, even if its strengths aren’t usually what The Mane Quest focuses on. I can easily forgive a few hickups in its art style and polish — and yes, even some not-so-elaborate horse mechancis — when a game provides me with so much lovingly crafted story, character and an absolutely solid core gameplay loop. My Time at Portia was released on PC (Steam, Epic Games Store and GOG) in January 2019 after a year in Early Access. Console versions have been announced for PS4, Xbox One and Nintendo Switch for Spring 2019.